This series of guitar fretboard lessons will provide the necessary groundwork for becoming an exceptional guitarist - and that's not hype! Many guitarists neglect learning the fretboard and seriously limit their potential as a result. If you want to be able to improvise (play what you feel, in the moment) on guitar confidently, this section is especially crucial. Knowing the fretboard gives you the roadmap for making your own music with intuition and purpose. But it's not difficult - you just need the right process, and that's why I created these lessons. Imagine a map without any roads or locations to show you a) where you are and b) how to get to your destination. Pretty useless, right? Well that's how the fretboard is likely to appear at first! In order to know exactly where you're going, you need some points of reference - knowing how one fret relates to another on each string. Your first task is to understand the basic function of the fretboard, starting with knowing what musicians mean when they say the "8th fret" (for example), numbering your frets and understanding the significance of the 12th fret (i.e. why does the 12th fret have a different inlay marker?). Each fret/string represents a note from the "musical alphabet" (A through G). We need to know where these notes are on guitar so we always have a reference point. This will ensure you can instantly locate any note no matter where you are on the neck. You'll see notes referenced in music all the time, so this is crucial stuff, but should only take a week or so to memorize. While learning the notes on each fret/string is important, you'll need to break up that large block of notes so you can compartmentalize the fretboard more efficiently. Your next step, therefore, is to explore the visual relationship between notes across multiple strings. This is your first step in seeing patterns (or "shapes") emerge from the fretboard. Already, through these three lessons, you'll have the key reference points you need to move from fret to fret without guesswork or undue hesitation. You'll see just how valuable and integral to your playing this skill becomes the more you progress. 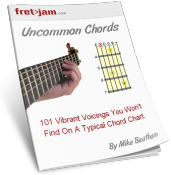 Many guitar players learn the fretboard notes, which is important, but few take that next crucial step before moving on to scales and chord construction - the ability to relate one note to another through how they sound and how they appear on the fretboard. It's the step that connects chords and scales - a concept I like to call the "big picture" and one that builds you a solid grounding for developing your improvisation skills - the ability to jam freely and intuitively. I'm talking about intervals - the very building blocks of music and the variable distances between two notes. It never ceases to amaze me how many serious players delay or neglect this stage. Nail it early on and you'll find all aspects of music theory so much easier to digest. Starting with the basic fret intervals, you'll know where to move a "half step" or "whole step" up or down from the note you're on. You'll also understand exactly what it means when you see a scale written in the following format: W W H W W W H. These are all terms and symbols you'll come across during your musical journey. Don't be left in the dark! The next step is to combine these small intervals into larger intervals that you'll see (and hear) referenced in both chords and scales. This is the connection that so many overlook. A major 3rd in a chord connects to a major 3rd in a scale! When soloing over chords and writing songs that flow naturally, you'll benefit hugely from knowing this stuff. Once you know what they are, it's time to map intervals out on the fretboard so you can visualise them from any position on the fretboard. Again, a massive head start if you're interested in improvisation and being able to play confidently with no second guessing where to put your fingers to get the sound you want. 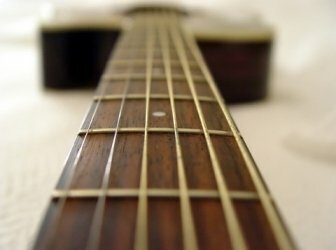 And finally, bring it all together using these powerful fretboard memorization exercises to help you internalize this knowledge and prepare you for your journey towards a greater understanding of music on guitar - a journey that will open up your creativity, guide you through meaningful harmony and melody and keep you from wandering unintentionally into dissonance. It should all be a heck of a lot easier now! While you're here... need some blank fretboard diagrams?